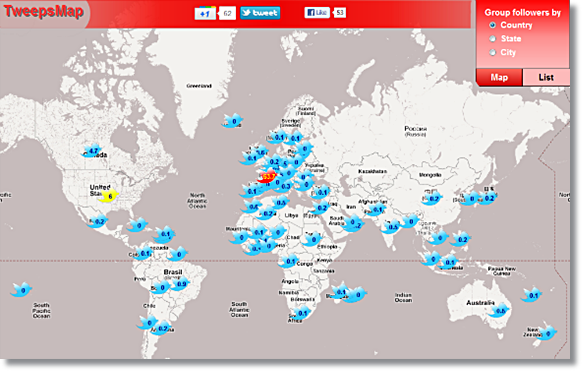 AccuraCast SearchStarz Blog: Do you know where are your Twitter followers located? Do you know where are your Twitter followers located? 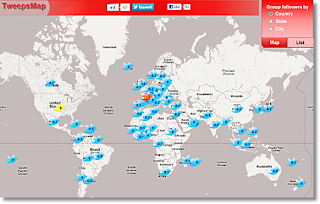 With TweepsMap, you can analyse your Twitter followers presence. You can measure the effectiveness of your Social Media campaigns and know if your followers are engaged or not. It shows where they’re located by country, state or city. You need to authorize TweepsMap API, and it generates color-coded map. Twitter red birds represents the largest number of followers, and yellow represents the second largest number.